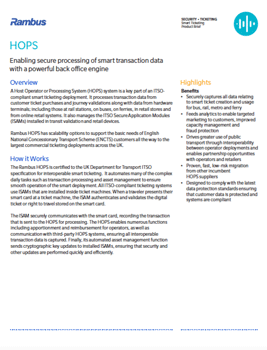 A Host Operator or Processing System (HOPS) system is a key part of an ITSO-compliant smart ticketing deployment. It processes transaction data from customer ticket purchases and journey validations along with data from hardware terminals; including those at rail stations, on buses, on ferries, in retail stores and from online retail systems. It also manages the ITSO Secure Application Modules (ISAMs) installed in transit validation and retail devices. Rambus HOPS has scalability options to support the basic needs of English National Concessionary Transport Scheme (ENCTS) customers all the way to the largest commercial ticketing deployments across the UK.